In a nutshell Equine Touch is a non-invasive, non-diagnostic, non-manipulative soft tissue bodywork which uses a simple yet specific move, in a set pattern to address the whole horse. Equine Touch works on a physical, emotional and spiritual level for any shape and size of horse, of any age, and in any level of work. Before a session Jo will ask a variety of questions (which can be answered prior to the session by completing and emailing this form) to assess both your’s and your horse’s needs. As with any bodywork, it is a legal requirement that you inform your vet that your horse is to receive Equine Touch. Jo is happy to discuss Equine Touch with your vet should they require more information. You will be asked to sign to say that you have done this. Branding is where Jo introduces herself to the horse, briefly scanning his body using her hands to feel for any particular issues, and also introduce her hands to areas where she is likely to place moves so that he is aware of her intentions. She will also pick up each foot in turn so a good surface is essential to avoid slipping. Jo will then carry out a Body Balance address, placing a pattern of moves over the horse. There are a number of Body Balances Jo could use and these may vary from session to session depending on the horse’s preference and requirements. Depending on Jo’s findings throughout the session so far, and the horse’s reactions to the session, Jo will then place further moves over areas of concern. Throughout and following the session Jo will provide feedback and advise any further requirements. Which horses should have Equine Touch? Youngstock: to support the physical and emotional needs of a growing horse. Pleasure Horse: to maintain health and well being. Competition Horse: to encourage performance, reduce the likelihood of injury, and improve recovery. Broodmare: to support the mare throughout gestation and after foaling. Veteran and/or Retired Horse: to help ease those aches and pains following years of work or injury. Rescued Horse: to engage with the horse in a non-threatening manner and support their rehabilitation. When can a horse not have Equine Touch? If your horse is currently receiving veterinary treatment you must request permission from your vet before Jo is able to attend. Jo works without gloves on so horses with contagious skin conditions or other contagious ailments will not be able to be worked on. Some moves also carry contraindications for pregnant mares so Jo should be made aware of any pregnancies before the session. What to do prior to an Equine Touch session? Horses need to be clean and dry for the session. Jo needs to be able to feel subtle differences in the coat texture, and temperature and tension of the underlying muscles. This is impossible if the horse is either wet or muddy. The area where the session is to take place should be somewhere sheltered from the elements and on a surface where the horse is not likely to slip. The atmosphere should be calm but not necessarily silent. Excitement such as other horses passing by, or feeds being made up should be avoided where possible so the horse is fully able to concentrate on the session. What to do following an Equine Touch session? Horses should not be groomed or worked within 24 hours of a session. This is to allow the body time to fully process it. Horses should have a good supply of clean, fresh water. They may drink more as Equine Touch can have a strong detoxifying effect. Horses may initially feel a little stiff, or over fresh in the days immediately following a session as the body realigns itself. This should pass without issue, however if you are at all worried give Jo a call. Equine Touch Session: £35 per horse. Milage is applied at 50p/mile in all cases where Jo is travelling over 10 miles from the previous appointment, or home. 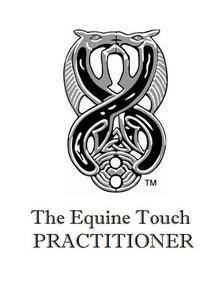 For a list of Equine Touch Practitioners in other areas please visit The Equine Touch website.